Continuously Managing Change in meaningful ways that focus on how people walk the talk! Managing change requires seeing the big-picture context in which your organization operates, so people know why things happen as they do. The 3-D Mission, Resources and Context (MRC) focus helps your team see which variables are important to the organization's future. Motivating people to continually move in a mission-focused manner during change is challenging, but nevertheless can be done effectively! The 3-D MRC system helps everyone better understand how they fit into the organization's big picture. Seeing these relationships within the larger context makes change more apparent. 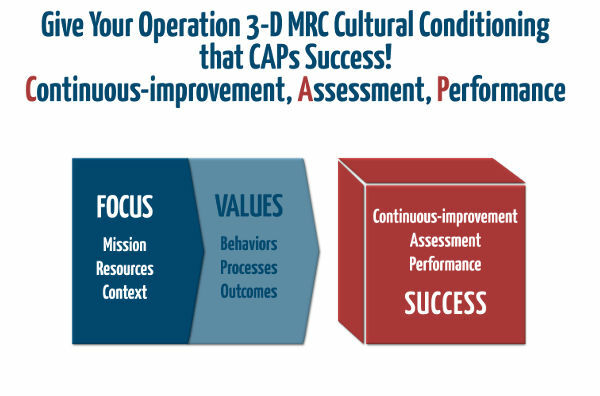 3-D MRC values drive the behaviors that support the processes that lead to desired outcomes. Real change does not happen easily. Anyone who tells you so is enticing you with nice sound bytes of theory. Our decades of real-life experiences in all types of large and small organizations enacts practical change that effects operational outcomes! Our 3-M Change Management Model focuses on motivating people with a mental map that tells why change is necessary for the organization to achieve its goals. Process mapping this compelling vision in forward-looking initiatives promotes an upbeat work culture. Messaging it in ways that reinforce meaningful operational changes increases "buy-in" that supports productivity that fulfills objectives one effective process at a time!